For the former Red Cross nurse Chizuko Uchida August 6, 1945 symbolizes a radical cut in her life. During her training under the Japanese military regime she was taught that working as a Red Cross nurse is of significant beauty. Cleansing and caring for the wounds of injured soldiers was glorified in propaganda songs as an aesthetic act. But when Chizuko Uchida was confronted with the reality following the dropping of the atomic bomb in Hiroshima, all she felt was disgust and revulsion. She had landed in hell and this experience marked her for the rest of her life. After the war, Uchida became a follower of the well-known feminist writer Tomoe Yamashiro, who became famous for her socially critical novels. From Yamashiro she learned _“that there will be war in Japan again and again, as long as women say yes to everything men do.”_Yamashiro convinced her that it is a significantly important task for women to voice their opinions, and at best through literary or artistic work. Uchida took this to heart. As a result she began to write down her Hiroshima memories and to deliver public lectures. Uchida holds the firm conviction that doing little things locally, for victims of war and catastrophes is worth it. As a member of the Junod Association, acting for years on behalf of radiation victims from Chernobyl and now for those in Fukushima, she has tried to do this for years. And she knows what she is talking about because she herself had to fight hard against the symptoms of her own radiation sickness. She suffered from anemia, fever, swollenness and shortness of breath. Bone abscesses meant that at times she could not walk. Ten years ago, she decided to “sweat out” the poisons in her body. She began to work hard in the fields and to sweat as much as she could. With time, her blood tests normalized and she felt better and better. Even today, twice a week, she drives with her electric car for one and a half hours uphill to work on a remote field. 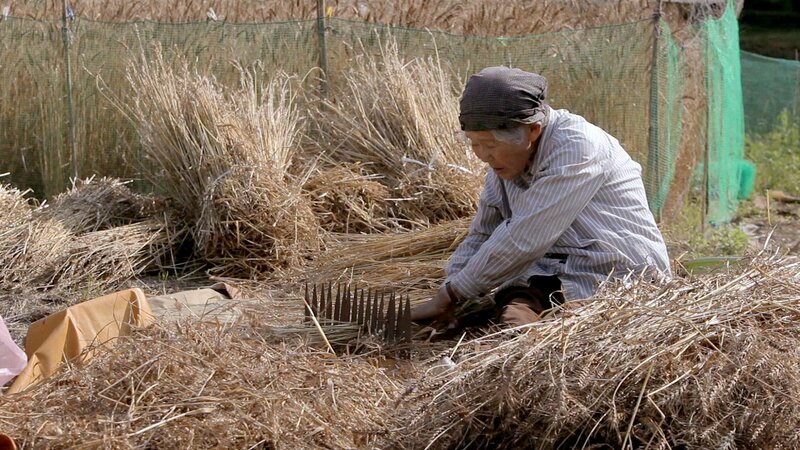 She cultivates various types of vegetables and wheat from which she bakes her own bread.